Honey bees, bumble bees, and solitary bees pollinate crops and wildflowers and are essential for both human and planetary well-being. The new EU Horizon 2020 project PoshBee aims to support healthy bee populations, sustainable beekeeping and pollination, since bees face many threats and are often in decline. PoshBee: Pan-european assessment, monitoring, and mitigation of stressors on the health of bees will integrate the knowledge and experience of academics, beekeepers and farmers to provide the first comprehensive quantification of the exposure hazard of chemicals to managed and wild bees, as well as to determine how chemicals affect bee health. 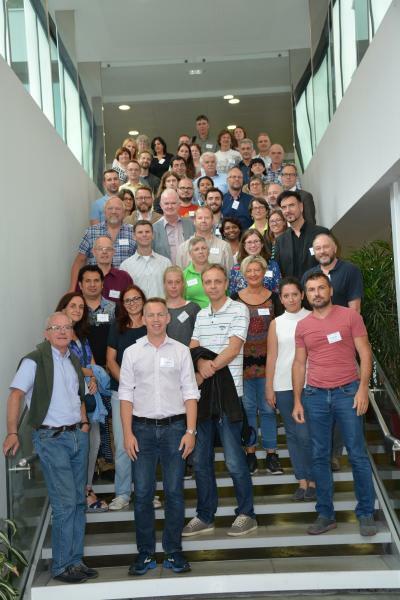 The project holds its official kick-off meeting on 27 and 28 August in Paris, France, where over 50 scientists, experts and stakeholders of 42 partner organisations from 14 European countries meet for the start of the five year research and innovation action. PoshBee recognises the need for this joint research initiative because the negative impact of agrochemicals on bee health and their relevance in the real world remain unclear. “Based on the expertise of a diverse range of actors, the data collected within PoshBee will tackle the issue of sustainable bee health and fill a major knowledge gap in the exposure hazard of chemicals for bees.” comments coordinator Mark Brown from Royal Holloway University of London. Major results are foreseen until the end of the project in 2023. Through the development of innovative protocols and novel model systems, PoshBee will assess toxicity and dynamics of key agrochemicals and their mixtures, and provide key information for the development of improved policy and regulations for the safe and sustainable use of agrochemicals in Europe. PoshBee plans to provide a holistic understanding of how chemicals drive health in honey bees, bumble bees, and solitary bees, which will help beekeepers and other stakeholders improve bee health management, and reveal how hazards interact to threaten bee health. Within PoshBee, the first mechanistically-underpinned holistic model of bee health will be developed to validate agent-based, landscape-explicit models for risk assessment in honey bees, bumble bees, and solitary bees. The project will provide validated tools for the monitoring and assessment of bee health and exposure to stressors, which will result in a novel molecular monitoring tool, or ‘health card’ for bees, that measures chemical exposure, pathogens, immune capacities, and nutritional state. Working together with key stakeholders in the honey bee, agrochemical, farming, pollination service, research, EU policy and regulatory, and bee conservation sectors alike, PoshBee will develop a European bee health knowledge exchange hub to help synthesize and disseminate research findings among stakeholders across Europe. PoshBee is funded under Horizon 2020 Call SFS-2016-2017: Sustainable Food Security – Resilient and resource-efficient value chains, grant agreement No 773921. The project has a duration of five years and brings together 42 partners from 14 countries across Europe in its consortium.